Forbes recently turned to Hookit’s HVM to help nail the Jell-o to the wall when it comes to Cristiano Ronaldo’s incredible social engagement and its actual value for his sponsors. Ronaldo is the first athlete to surpass the 200M follower mark and — love him or hate him — when the man posts, people listen. Like, a lot of people. 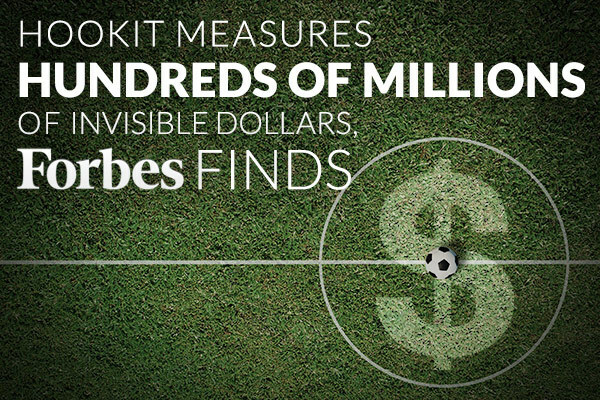 With Hookit’s help, Forbes showed how the most influential figure in sports wields that influence and how one of his posts could possibly drive $ 1,858,569 worth of value for key sponsor Nike. CR7 earns $27M off the pitch every year and his social strategy is an object lesson for all of us. Excess hair gel optional. 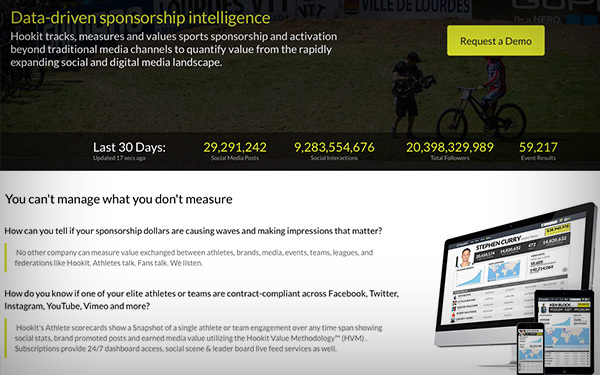 Sports Business Journal has used Hookit’s HVM to measure athlete and sponsor value since before it was even a thing. SBJ was the first major media outlet in the sports space to recognize Hookit as the #1 source for credible data in the social space and for this we thank them. See the article here. First NBA deal in place, valuing three sponsors for entire season. Event Report for LPGA Championship, tracking value for three top sponsors: KPMG, ROLEX, KIA. Tournament Event Report for Soccer United Marketing showing value for Budweiser, Powerade, MasterCard. Roster Report measuring social media movement and value w/r/t Rio 2016 Olympic kit made by legacy Canadian clothiers, Hudson’s Bay. Event Report and streaming dashboard “social scene” for on-site. Earned media evaluation for all sponsors post-event. Free soda. Measuring 24 event reports for the whole season of National Hot Rod Association races against three major sponsors. Austin Business of Sports Summit was brave enough to have Hookit CEO Scott Tilton and CRO Carl Thomas for a presentation in front of 80 elite sports marketing execs last month. Repping brands like ESPN, the LA Lakers, UFC, Seattle Sounders and the Canadian Olympic Committee, these lucky execs got to hear how Hookit holds it down in real time, offering unprecedented accuracy when it comes to tracking social media value. Steve Mariucci, COO: A noted entrepreneur and business advisor in the Sports and Active Lifestyle (SAL) industries, Steve is also the founder of Adscreen Group, an athletic field product sales and distribution company. Before joining Hookit, he was President at Dial Equities, Inc., a multifamily real estate acquisition and management company. Carl Thomas, CRO: With 25+ years of senior executive experience in general management, sales, marketing, business development, and strategic planning, Carl can pretty much see around corners. Career highlights include: CEO at X-1 Audio; CMO & EVP Sales at tickets.com; and SVP at Universal Studios. He’s also an ’09 inductee into the Triathlon Hall of Fame so he sometimes comes to the office with Sharpie’d numbers on his arm. Fran Richards, VP Marketing: A passionate brand leader with experience across sports, music, luxury consumer goods, and destination travel, Fran is the genuine article with business savvy and enthusiasm to match. He comes to Hookit after leading roles as VP at Red Mountain, Spy Optic, and TransWorld Media, where he helped grow the company from small magazine publisher to $37M media powerhouse culminating in a sale to AOL/Time Warner. All this and he still skates vert. Sam Simkin, CFO: With 20+ years of success implementing financial and operational strategies for startup and high growth companies, Mr. Simkin is uniquely suited to help Hookit as it hits full stride. His corporate scar tissue derives from time in the trenches as CFO at X-1 Audio and SportsGiant, CFO/COO at Newgen Results Corp, an MBA and law school. He’s also secretly Canadian. Hookit possesses the most robust valuation platform in digital, quickly becoming the market standard in sports and beyond. But we also know that you’re only as good as your last game. To that end, we are constantly upgrading our methodologies in order to provide up-to-the-second data-driven sponsorship intelligence. Want to know what your brand’s worth right now? Hookit can tell you?-in a way nobody else can. HVM, the Hookit Valuation Methodology, is constantly evolving and is untouchable when it comes to measuring team, athlete, or brand engagement. Now includes video recognition. The Hookit Sport Graph, our digital map of the global sports ecosystem also continues to grow. Check out our newly re-designed business page and request a demo of the platform. See it now. In a world where broadcast television has historically driven the value of sponsorship assets, Hookit is entirely focused on the much larger social and digital media landscape to find completely untapped value. Through its proprietary HVM (Hookit Valuation Methodology), Hookit effectively tracks and measures the earned media value of sports sponsorship in what it refers to as the ‘Current Media’ based entirely from actual engagement rather than assumptive based impressions. Based in San Diego, CA., Hookit offers the most comprehensive and exacting data analytics platform for establishing and tracking the value of individuals/athletes, teams and events across the sports and entertainment industries. Through its proprietary platform and Hookit Valuation Methodology (HVM), Hookit brings athletes, teams, brands, agencies, events, leagues and federations together in mutually beneficial partnerships. Hookit’s blue-chip client roster includes Go Pro, Monster Energy, IMG, Canadian Olympic Commitee, U.S. Ski and Snowboard Association, KAABOO and NBC Sports. For more information, visit www.hookit.com.